Fresh on the heels of the announcement that the four major carriers in the US agreed to lead the charge to enable text-to-911 for the FCC, the regulatory body is now considering expanding the scope of that program to include some internet-based messaging services, such as Apple’s iMessage. Building on last week’s announcement regarding text-to-911, the FCC is seeking comments about whether other carriers might get involved, as well as include some internet based services in the initiative. 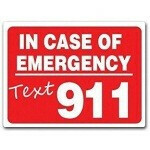 AT&T, Sprint, T-Mobile USA and Verizon have all committed to enable an automatic “bounce-back” message, a text to notify customers where the text-to-911 feature is not available and encourage them to call 911 if possible, by June 2013. The FCC is looking at the solution in the context of how everyone communicates, which would include messaging services outside traditional texting.